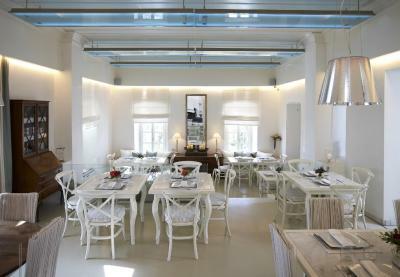 Lock in a great price for Semeli Hotel – rated 9.1 by recent guests! The good things- their cocktails! They are pricy but hands down the best cocktails I’ve had. There are two brothers that are the mixologists and they are amazing!! Amazing hotel with great views! The executive suite is amazing. The jacuzzi was divine!! Thank you. Immaculate and clean. Beyond perfect stay! This hotel is all about the STAFF STAFF STAFF. 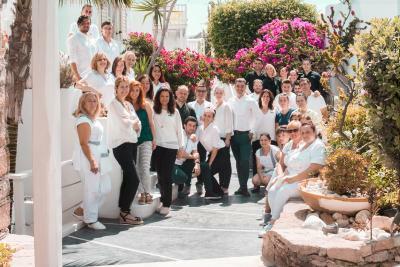 what an incredible team from the minute we landed they made us feel at home and they know what we liked and accommodated all our requests. 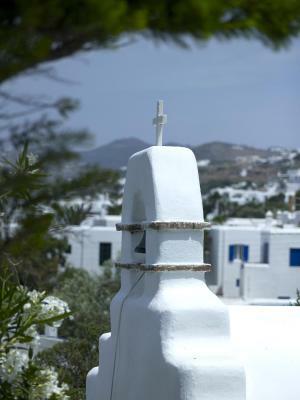 Location was great - heart of downtown Mykonos and short walk from bus stop/taxis. Clean and super-friendly staff, and the breakfast is amazing! Never seen such a spread of food, including desserts! Pretty pool, nice lounge chairs and towels all free. Property very clean and gorgeous flowers. Had a beeswax massage which was fabulous! Posh hotel with two pools, delicious restaurant, and friendly staff. The location was ideal as it was on the outskirts of town so it was quiet, but a very easy walk to and from the water and main streets. The setting is lovely. The hotel sits above the town but the climb to it when walking is very gradual. 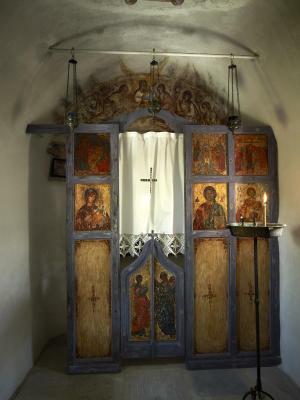 The decor is beautiful and the rooms, although a bit small are well designed and comfortable. Staff were so nice and helpful! Property is gorgeous, though undergoing off-season renovations! Breakfasts were quite ideal! Nicely prepared with fresh foods and eggs! Rooms were clean and excellent bath and shower! Room service excellent - absolutely no complaints at all! Highly recommended! Lovely Hotel with super Comfortable rooms, providing a luxury service. 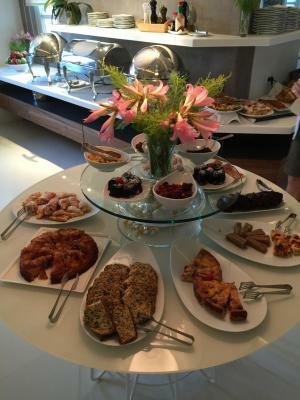 The Breakfast is Amazing out of this world and the Staff extremely helpful and made sure that we had a very comfortable stay. 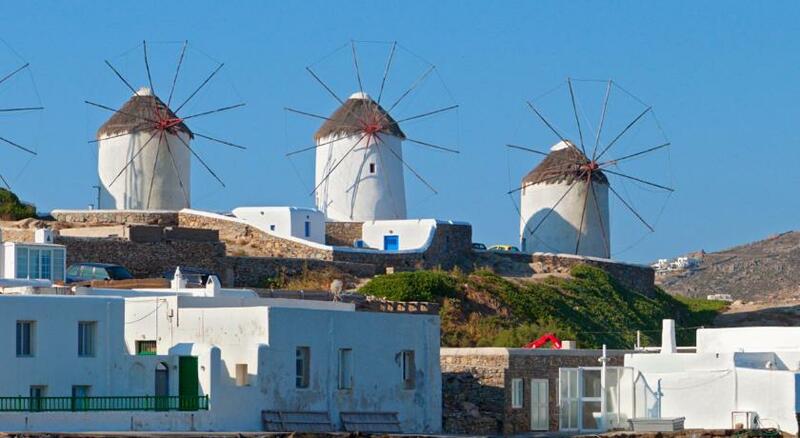 Just a short walk to the Port area and all other major attractions like the windmills, Little Venice and the town. Excellent value for money hotel and would recommend this to anyone travelling to Mykonnes. Just wish we stayed for longer at your hotel. Semeli looks even more beautiful in person than it does in the pictures. I was traveling with 5 friends and we stayed in the Garden Suite. 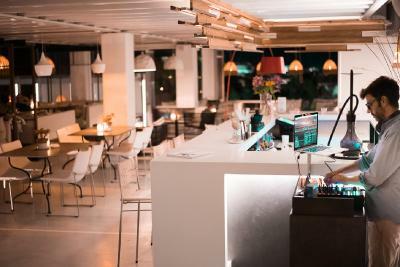 The food was delicious, the service was outstanding and the location was perfect. It was away from all the noise but only a two minute walk to get into town. The pools were the perfect ending to our busy day. 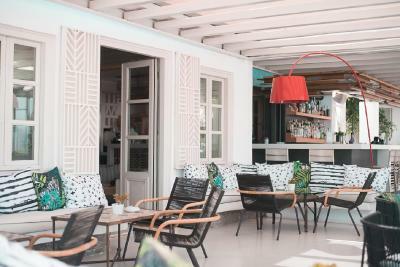 Semeli Hotel This rating is a reflection of how the property compares to the industry standard when it comes to price, facilities and services available. It's based on a self-evaluation by the property. Use this rating to help choose your stay! 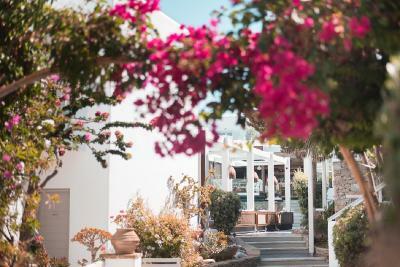 One of our top picks in Mikonos.The sophisticated Hotel Semeli is located in Mykonos town, 1,650 feet from Megali Ammos beach. 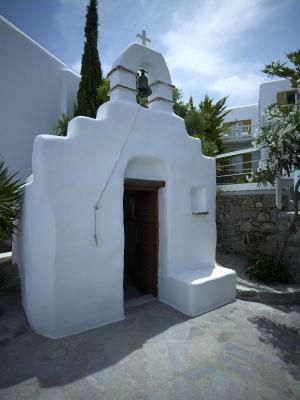 It features tastefully decorated accommodations with sea, town or garden views, a sweet-water, heated pool with sun beds and a spa. 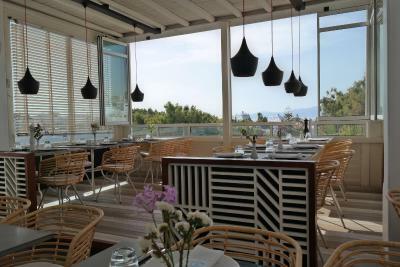 All rooms or suites at Semeli Hotel have a flat screen TV, seating area, marble bathroom and French doors with sea views. 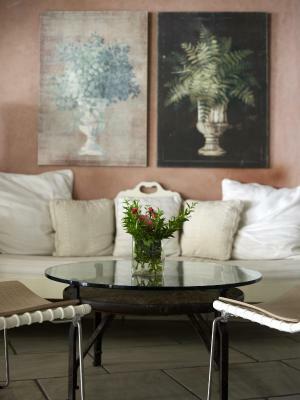 Whitewashed walls and a garden with geraniums and bougainvilleas provide the rooms’ exterior setting. Some units have an indoor or an outdoor hot tub. 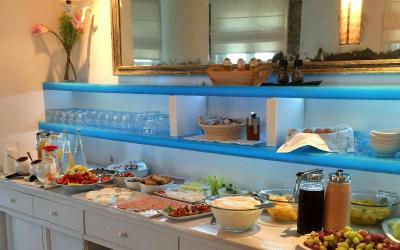 The a la carte restaurant Thioni serves a rich buffet breakfast by the pool. 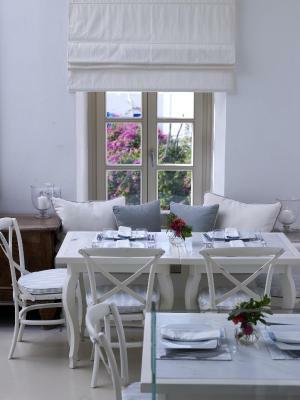 Greek and Italian cuisine is served throughout the day indoors or on the veranda overlooking the sea or the garden. Guests can enjoy cocktails at the hotel's pool bar. 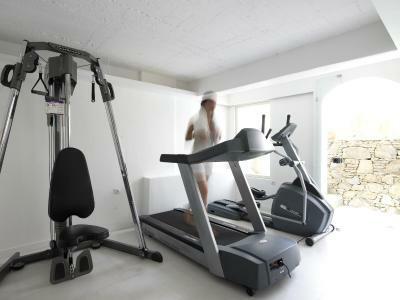 Guests can make use of the Semeli Hotel gym facilities or relax with a Turkish hammam, or a massage session at the Semeli Spa. 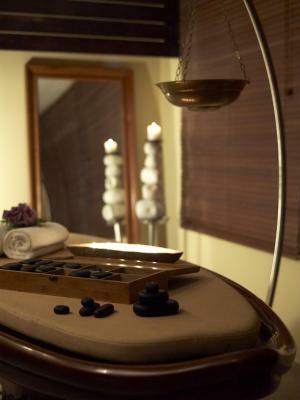 A variety of facial and body treatments are available. 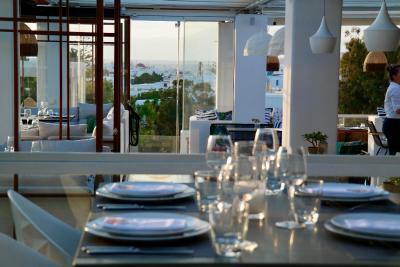 Within walking distance, guests can reach the center of Mykonos town where many bars, cafes and restaurants can be found. Free Wi-Fi is available in the entire hotel and free private on-site parking is possible. When would you like to stay at Semeli Hotel? This spacious 2-bedroom suite has a hot tub, 2 luxurious bathrooms and a sitting area. 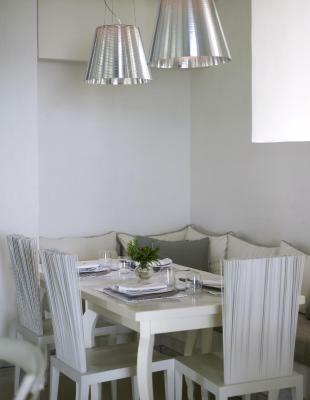 Located at the ground floor, this air-conditioned and tastefully decorated room opens to a terrace with garden views. It has a sitting area with flat-screen, satellite TV and a minibar. Free Wi-Fi is provided. Featuring an indoor or outdoor hydro-massage tub, this air-conditioned and tastefully decorated room is located at the first floor. 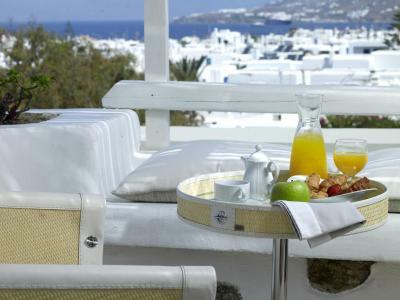 Opening to a balcony with views of Mykonos Harbour, it has a flat-screen, satellite TV and a minibar. Free Wi-Fi is provided. 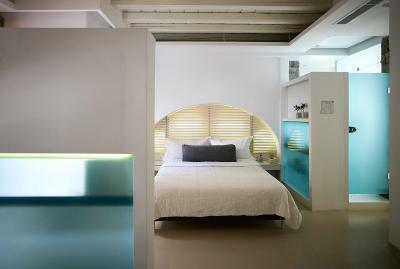 Located at the first floor, this two-spaced and air-conditioned suite is minimalistic in style. Featuring a seating room with a flat-screen, satellite TV, it has a glass partition to separate the bedroom from the seating room. Free Wi-Fi is provided. 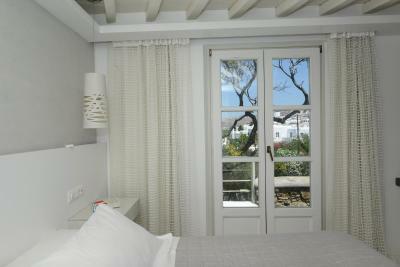 Located on the first floor, this air-conditioned and tastefully decorated room opens onto a balcony with Aegean Sea views. It has a flat-screen, satellite TV and a minibar. Free Wi-Fi is provided. 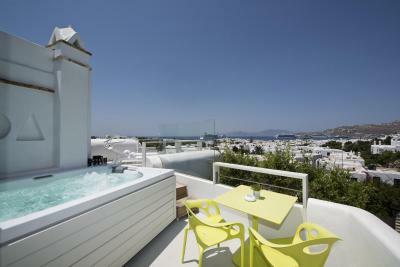 Featuring a hot tub, this tastefully decorated and air-conditioned suite opens to a balcony with views of Mykonos Harbor. It offers a seating area with flat-screen, satellite TV and a mini fridge. Free Wi-Fi is provided. 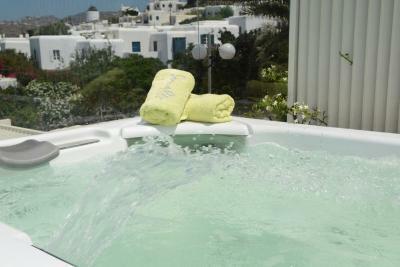 Featuring 2 hot tubs, this air-conditioned and elegantly decorated suite opens to a balcony with Aegean Sea views. 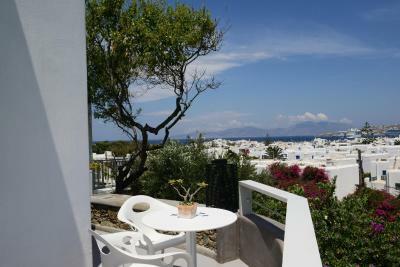 Consisting of 3 bedrooms, it offers a flat-screen, satellite TV and a mini-bar. Free Wi-Fi is provided. This suite has a seating area, dining area and soundproofing. 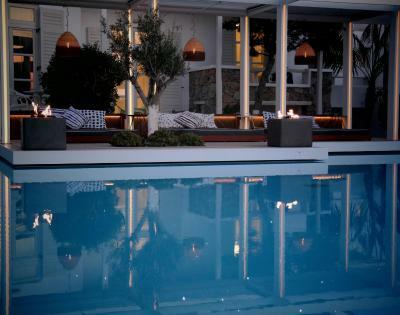 Semeli Hotel in Mykonos Town, amongst the most luxury hotels in Mykonos is fairly named after Zeus’ beloved Semeli, as the 5 star hotel reflects in Mykonos her name’s symbols of beauty and harmony. 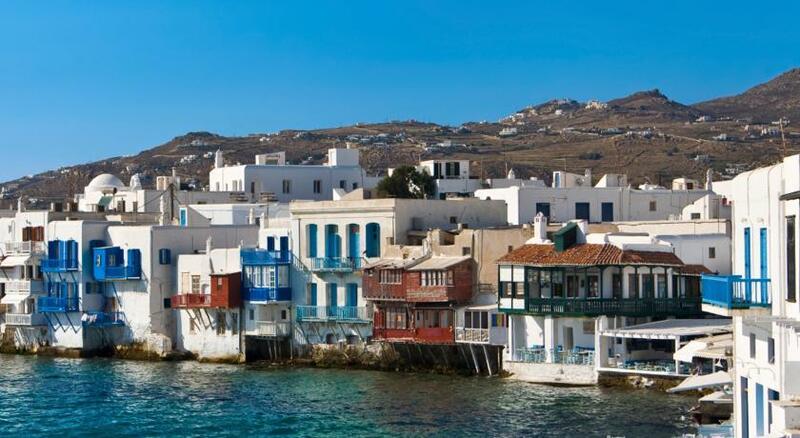 “Oh Semeli, sweet mother of wine, drunkenness, joy and mother of Dionysus…”; if the myth could ever turn to reality, it would definitely happen in Mykonos, the ancient nymph Semeli’s island. 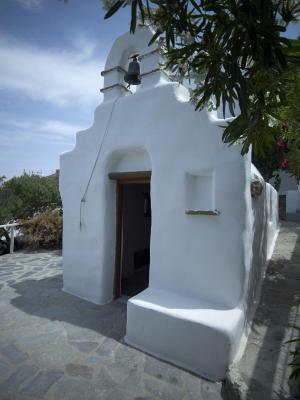 We thus created, with our heart and soul, Semeli hotel, a magical place in the heart of Mykonos town, using our fantasy and our dreams with regard to conceive a unique place of relaxation and warm atmosphere for our guests, in an exclusive aesthetical and elegant design. 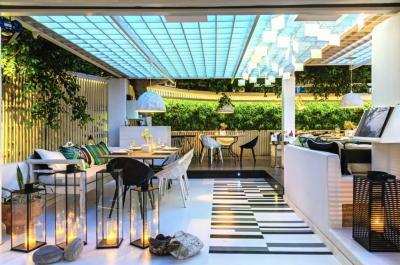 House Rules Semeli Hotel takes special requests – add in the next step! Semeli Hotel accepts these cards and reserves the right to temporarily hold an amount prior to arrival. 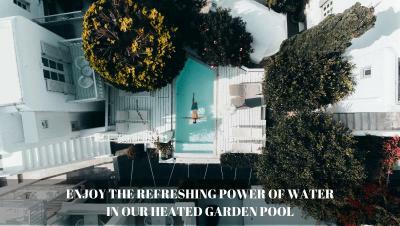 -the outdoor private hot tubs are temperature controlled and are operational during normal weather conditions. The hotel accepts no liability if the private outdoor hot tubs cannot be used due to extreme weather conditions. Extremely friendly staff at reception. Eliza was lovely and was very helpful! Good breakfast selection. Had soya milk as an option for my lactose intolerant sister. There was no real vegan option apart from bread and cereal but when we pointed this out, they catered for this :) Only a 5 minute walk into town. Great swimming pools. Gorgeous rooms. Late cleaning room. Apologized and gave us a bottle of wine . Handled situation well. The tables were filthy at breakfast. The hotel is 5 five yet you have to pay for a cappuccino it’s not offered at breakfast. The waitress at breakfast was extremely rude and unhelpful. There was never water for tea . Breakfast was self service with barely any options. Staff bot so hospitable..not friendly and not proactive in giving basic info. The room setup was perfect and everything was super clean! The drinks were amazing as well! We have been to several hotels in the past all over the world, there were a few things that were disappointing with this hotel: - We paid extra to get a room with a jacuzi, the jacuzi takes 3 hours or more to heat up. - They only give you one complimentary bottle of water and the small refills are all charged. - The restaurant doesn’t have many veg options - only two main dishes that were veg. 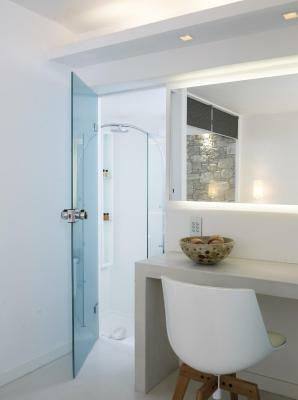 - The rooms gets very misty and the water condenses causing the floors to be wet and slippery - inside the room. That’s a little scary. 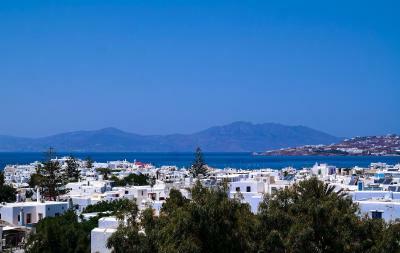 Perfect location - about a five-minute walk from the main part of Mykonos town, but still far enough away that you're not in the thick of it. Very helpful staff - from the receptionist to the bartender to the breakfast room staff, everyone was always smiling and helpful and knowledgeable, providing useful recommendations for sights, restaurants and bars. Breakfast is served until 12, which is great for lie-ins. Even in mid-March, the hot tub and the smaller heated pool were perfectly usable. Daily room cleaning. Beach towels were provided for free on request. Don't worry when you arrive if you can't find parking space upfront - a concierge will take care of your car and usually park it in their garage. The room itself was slightly smaller than expected and didn’t have its own bathtub as I think it said but otherwise perfect! Amazing staff, great pools, services while staying were impeccable. I loved the room terraces and the heated pool and hot tubs especially.